In addition to it being unusually hot this week, the humidity was pretty intense, which made it necessary to wear my lightest & loosest pieces possible to stay comfortable. Even my usual arm party felt too heavy & restricting in the heat, so it was just the right time to try out my new accessories from Lydali – this thin hammered cuff & adorable striped clutch are perfect for summer! I always love discovering new sites that have a interesting story, which is why I was instantly drawn to their handcrafted accessories & unique jewelry. Even better, everything is ethically sourced & affordably priced – check out my Shelf of more favorite items from their site below! Very cute! I am in love with that top.. SO cute! I think I need to steal that clutch from you!!! 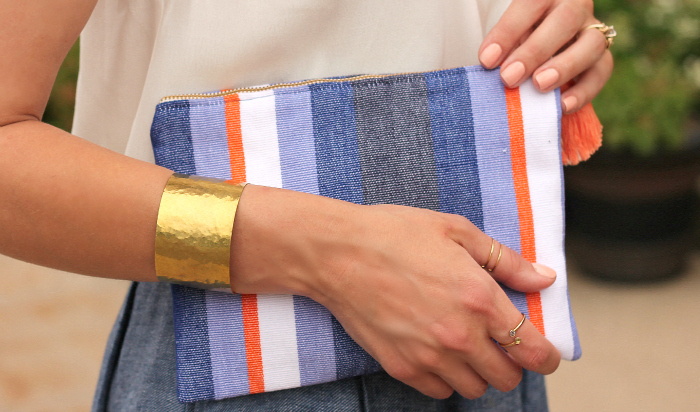 The clutch is lovely – perfect for summer! I love the detailing on the neckline of that tank..so pretty! I love the cutout detail on that top and, as a sucker for stripes, I just adore the clutch! What an adorable ensemble, Kim! Love it, especially the chambray skirt and zip pouch…too sweet. Your hair looks great, btw. Happy Friday!! You look so casual and chic! I looove this outfit. I love the combo of white and blue, is one of my favorites. Plus, that little clutch is adorable. So cute. Love that top. i love your top! you look fantastic! This is so cute! I love that top. Girl, it is miserable in Louisiana. Humid all year long. Even in the winter. You are so sweet – thank you for your support, girl!! I love the cutout details on this fun top and your chambray skirt is the perfect length. Great outfit! Love the cuff and clutch! What an adorable top! Love it! I'm loving this outfit, the cutout on that top is super flirty and I love the denim like skirt. I hear ya in the heat! It's been over 100 degrees here almost all week! This look is perfect for staying cool and that clutch is adorable!! Have a great weekend!! The detailing on the top is so pretty, and this color combo is just gorgeous! Oh I love that top! Looks perfect with the rest of your outfit. 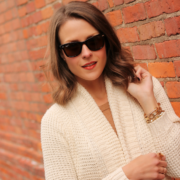 Your top and cuff are perfect! What a fun top and love how the stripe clutch brings in color & ties the outfit together! Love this clutch!! And the neckline of this top is just gorgeous! Hope you are having a wonderful day! I used to have a top with cutouts very similar to this one and I wore it into the ground — this Bar III one is the perfect replacement! Love the clutch and the bracelet! I hadn't heard about Lydali before – thanks for sharing!